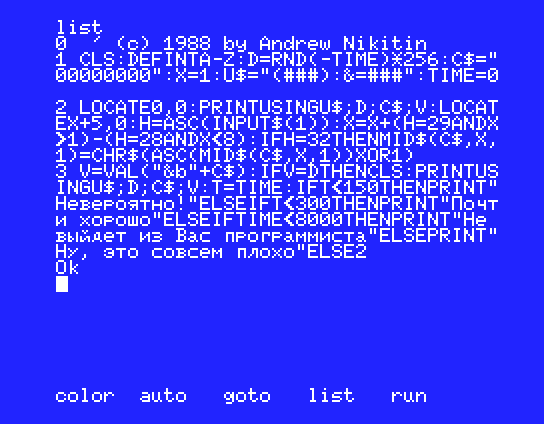 Around 1987 ИПИ АН СССР developed and distributed among schools wonderful software bundle “Информатика-87”. It contained software to help teach children informatics and related stuff. Some of that software was real masterpiece, like MSX emulator for MSX. Among other programs there was a game called Byte. In this game player was presented with a number 0..255 and had to set/reset bits in an 8 bit sequence to match this number. It also measured time, recorde resuts, kept top 10 score table and other things that game usually do. Computer generates random number in the range 0..255. You need to type in its binary equivalent by selecting bits with arrow keys and toggling them with space key. Number on the right of '=' sign shows current value of bit combination. Download the original KYLOBYTE.NSG code or internationalized version. Minor trick here is the usage of VAL function to convert from binary to decimal. I think MSX BASIC manual did not mention this possiblity explicitly.